There are few countries in the world that have the advantage of a strategic location to support international trade (import and export activities). One of these countries is UAE that has a suitable area of Dubai to support all types of trade activities around the globe. Dubai is situated on the Persian Gulf and had an important role for international trade even before the recent business boom after its independence in 1971. Dubai soon adopted diversified economy after independence where new business opportunities and tourism sector were given preference. But apart from creating new opportunities, the government has also improved already flourished business. This also includes import and export business on international level. For this purpose, Dubai has not only modified its rules to facilitate traders but also came up with new areas to establish international trading companies. Now, the traders can establish their business to import and re-export all types of products through various free zones present near the seaport and airport. Due to strategic location of Dubai, international traders can easily use Dubai as a transit location between markets all over the globe. Raw products can be imported, manufactured and then export to other countries. This will enhance profits to traders because the whole process of import, manufacture and re-export is either completely tax free or has very little tax is required. World-class facilities are also available to manufacture a product from raw material that adds its standard in international market. Along with that, exporting a product from Dubai to any other international destination adds value to product due to reputation of Dubai as an international business center. In Dubai, international traders can use Dubai mainland as well as few designated free zones to setup their businesses. One such example of an established free zone is DMCC – the world’s best free zone. This free zone provides one of the world’s best opportunities for import and export of various food items, precious stones etc. Dubai has also advantages for international trade due to several agreements made by UAE. UAE is a member of GAFTA (Grain & Feed Trade Association) that enhances chances of international grain trade from Dubai. 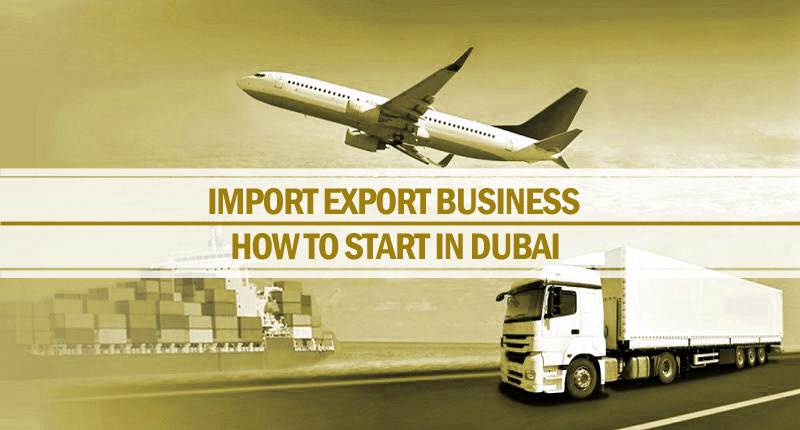 If you want to start import and export business in Dubai for international trading, then you will require general trading license for this purpose. There are several benefits for general trading license in Dubai. This license will allow you to do international trading of products by using market of Dubai. If you are willing to setup trading company in Dubai mainland, then the main authority to submit all your necessary documents and seek approval for company formation is DED (Department of Economic Development). Along with that, approval of name and trading activities must be obtained by relevant departments. Ports and customs department will provide import/export customs code for traders while Dubai Municipality (DM) is also required for import of products (especially food products). Acquiring this license will allow you to import, manufacture, sell and re-export products of your choice. Good opportunities are also available in DMCC and few other free zones that facilitate international traders according to their requirements. In this case, the traders will be required to submit application with all necessary documents in related authority of that specific free zone. These free zones are considered best for international trade as they provide all facilities needed for import, manufacture and re-export of goods at a single destination.